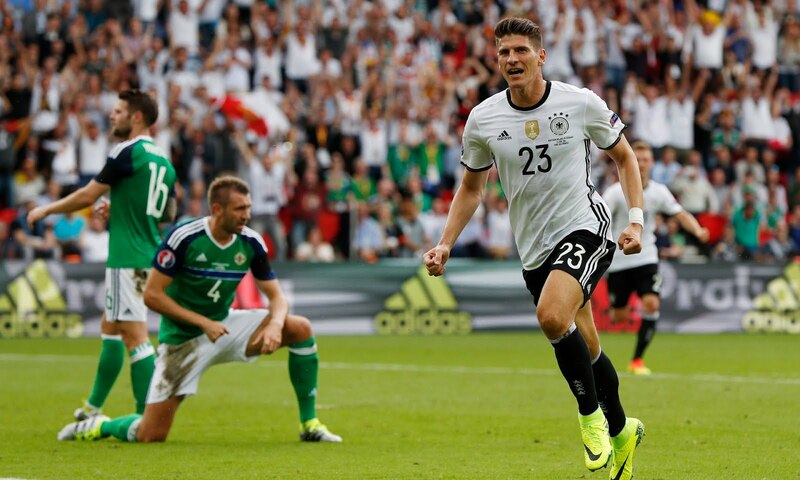 A first-half strike from Mario Gomez was enough for Germany to topple Northern Ireland and advance as Group C winners. A stunning performance from Michael McGovern in goal thwarted the attempts of Gotze, Muller and Mesut Ozil, before Gomez eventually broke the deadlock in the 29th minute. With a spirited legion of support behind them, Northern Ireland defended astutely and were resilient in their attempts to throw goalkeeper Manuel Neuer off guard on the counter attack and from a couple of corners. From the outset, the men in green made it clear they were not going to just sit back against the world champions, and piled on a raft of early pressure in search of an early goal. Despite their efforts in attack, the Northern Irish were almost caught out at the back by Thomas Muller and Mesut Ozil. The Arsenal man's exquisite pass through for Muller was met by a fiery shot which McGovern did well to keep out in the net, a sign of things to come. On the counter though, Conor Washington scampered forward for the minnows, but Jerome Boateng did well to keep the striker quiet. Moments later, McGovern was again the hero for his side, making up for the lackadaisical defence ahead of him with a fine stop to deny Mesut Ozil. The German craftsman tried his luck again but skewed his shot over from 12 yards out. Michael O'Neill's men were struggling to get the ball out of their box, and their goalkeeper had enjoyed the most touches of any player in their team. A long evening lay ahead. Mario Gomez chested down a lofted ball for Thomas Muller, but the Bayern star was unable to finish from a tight angle as he watched his drilled effort travel wide. Again, Muller was in the thick of it, as his diving header crashed against the base of the post from Josua Kimmich's cross. Clearly not having any luck against McGovern, Muller turned provider as he teed up Gomez 6 yards out, and the Besiktas forward accepted the invitation to notch in from close range. It was a goal that vindicated his imposing presence as a 'proper' striker for Germany, with Mario Gotze proving ineffective in a false nine role against Ukraine and Poland. Northern Ireland knew that they would be heading through as a best third placed side unless they endured a heavy defeat, so the fear of the floodgates opening subtly sunk into the vocal fan support. Jonas Hector went on a lung-busting run to carve an opening for Mario Gotze, but the midfielder was frustrated by McGovern - clearly in the form of his life while his defence looked out of sorts throughout the game. Kyle Lafferty entered the field for Northern Ireland, with his nation hoping for a miraculous performance. Jonny Evans leaped to head over from a corner as Germany rung the changes - Mario Gotze and Sami Khedira replaced by Andre Schurrle and Bastian Schweinsteiger. Andre Schurrle had a shot blocked by Evans and Gomez again let fly as it became clear Die Mannschaft were not prepared to settle for a narrow victory. Right-back Joshua Kimmich was particularly outstanding throughout, the young right-back floated in a series of dangerous crosses for his teammates and looked comfortable in the senior setup of the world champions. The game closed out, but The Green and White Army had not stopped singing in the stands, with big hopes of still advancing to the knockout phase resting on the results in the remaining group games. Germany will be satisfied with their attacking, vibrant performance, and with three clean sheets in three games, the defence looks settled for bigger challenges ahead.